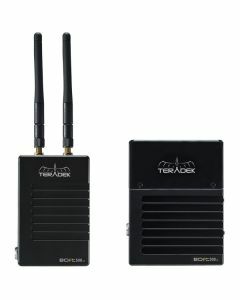 The Bolt LT takes Teradek's industry-leading wireless performance and packages it into an affordable, streamlined series of zero-delay wireless video systems. The LT line is available in 500ft or 1000ft max-range models, with the LT 500 offering external antennas on the transmitter for enhanced wireless performance - this package includes a 500ft Wireless HDMI Transmitter and Receiver set. The Bolt LT takes Teradek's industry-leading wireless performance and packages it into an affordable, streamlined series of zero-delay wireless video systems. The LT line is available in 500ft or 1000ft max-range models, with the LT 500 offering external antennas on the transmitter for enhanced wireless performance. Not only lighter, but smaller too, the Bolt LT is the essential, no-frills high performance wireless video system. Each transmitter includes a single 3G-SDI or HDMI input with matching looping output, while the receiver includes a single 3G-SDI or HDMI output. Several â…œ” and ¼”-20 mounting points allow Bolt LT to mount seamlessly to any camera rig and integrated bi-directional Sony L-series or Canon LP-E6 pass-through battery plates allow you to power your system far more easily than before.